Mauro Valli was born in Sant’Agata Feltria, the same birthplace of Angelo Berardi. Valli descend from the great school of the legendary cellist Camillo Oblach, the favourite cellist of Toscanini famous for the magic velvet sound of his playing. He has worked with notable musicians such as Maurice Steger (making with him very succesful recordings) and Anner Bylsma, who described him as a Master of embellishment. Member Founder of Accademia Bizantina, he has also played as soloist and first cello in others well known chamber music groups such as Quartetto Sandro Materassi, Il Complesso Barocco of Alan Curtis, I Barocchisti di Lugano of Diego Fasolis. He has appeared in some of the most important Concert Halls of the world, always to great acclaim. 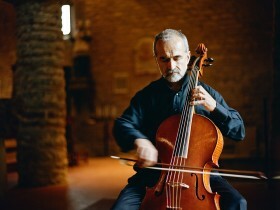 Both as soloist and as chamber musician, he has made many records with well known companies such as Decca, Denon, Harmonia Mundi, Arts, and these have always been favourably rewiewed; the records include Concerti by Vivaldi and Leo, Sonatas by Scarlatti and Trio Sonata by Bach, Corelli, Galuppi, Platti. His last CD – the first world recording of the Six Canzoni by Angelo Berardi – was published by Sony. He also plans to record Bach Sonatas and Suites, and Vivaldi Concertos with Diego Fasolis, with whom he regularly collaborates. His concerts have been transmitted by some of the main Radio and Television station of Europe. For about thirty years he has dedicated himself to playing baroque music on original instruments and to the rediscovery of historical instruments such as the five-stringed violoncello piccolo, the Arpeggione and the Baryton. He plays a cello made by Andrea Castagneri in 1740 and also uses a violoncello piccolo and a copy of a Montagnana made by the violin makers Lucia Valli and Matias Herrera. With theyr help he has produced a copy of an Arpeggione conserved by the Museum of Musica Instruments of Berlin. He has a lecturer in chamber music at the Conservatorio of Bologna, and he has taught for ten years at the Conservatorio della Svizzera Italiana of Lugano.